"In the year 2055, life is just another word for chaos. Sure, your music has given you some moments of escape, but your rock superstar status has also given you too many nights locked away in hotel rooms, away from the din of crazed fans. Virtual Reality is the only reality that means anything anymore." "Life as a Rock & Roll Mega Star in the 21st Century has it's downside, a year long International concert tour along with the constant threat of being mobbed by adoring fans has resulting in a need to remain confined to the Hotel Suite." "Join our Mega Star as he flees stardom by escaping into the Action Packed Virtual Reality Worlds of Mars, The Haunted House and The Underwater World." So, just to be clear, there's nothing at stake and there's no antagonist. We're playing as a guy playing a game because he's bored. That's an original approach to first person shooters. They did things differently in 1994. Okay, I have a choice of episodes: Mars, Marine or Haunted House. Don't see any reason not to try 'em all. Mars first. No plot, just action. Go go go! That digitised bloke in the centre of the screen is our Mega Star. Aside from him, I can't really see a lot. It sure is dark here on Virtual Mars. I'd yell at him for not taking his sunglasses off, but they might be part of his SEGA Lock-On VR system. There's a suspiciously radar-shaped hole in the interface, so that'll come in very useful, assuming it can see further than I can see normally. 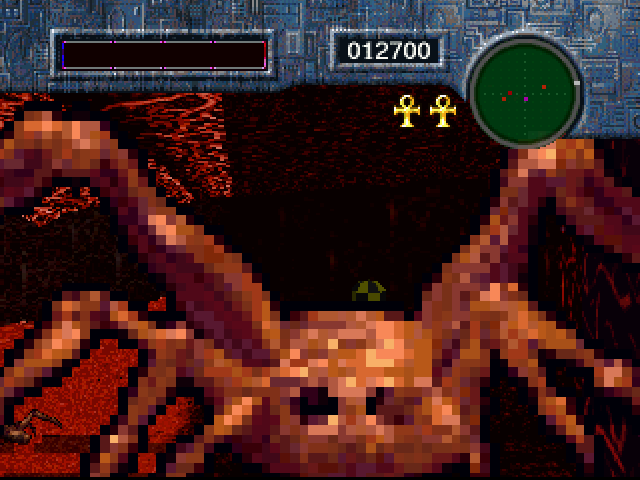 Incoming evil pre-rendered sprite spiders. Get 'em Mega Star! The radar pickup was in that yellow and black ball right next to the start position. Handy. Makes you wonder why they bothered. 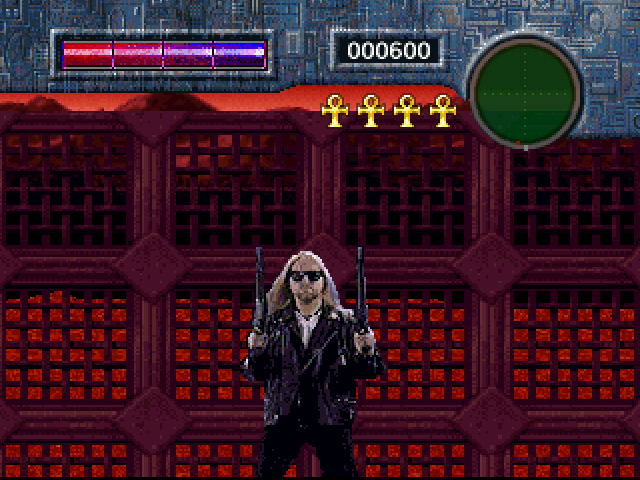 This game seems to be a lot like Die Hard (no, the other one). To shoot, you need to hold Space until Mega Star crouches down and starts unleashing a volley of automatic laser fire from his two sawed-off shotguns. While I'm crouched, I can't move but I can swivel around 360 degrees. Not exactly the best choice of battle tactics, Mega Star. These spiders and bees can only hurt you by walking into you, so why can't you shoot while walking away from them? Maybe that'd be too many animation frames... but you're barely on screen when you fire as it is! Who'd notice if you just bobbed up and down when you moved? Do I really have to call this guy 'Mega Star'? That's an awful name. Not even Kirby characters have names like that. Can't I give him a cool name like Mattias or Lars or something? After shooting open all the bonus pods, finding the key and finding the exit (a very small hatch on the ground somewhere), I'm safe and sound on Level 2. The game asks me if I want to save. Neat. 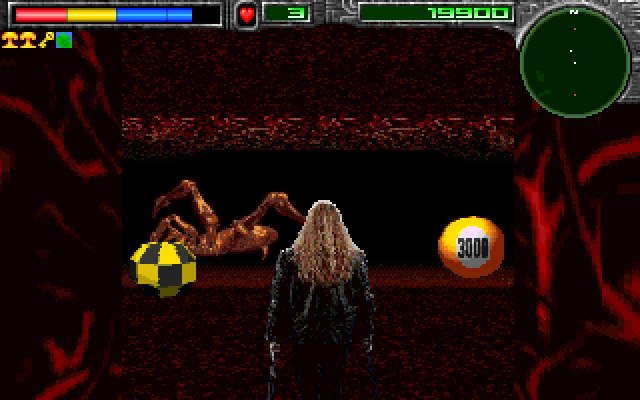 Dodging out of the way of incoming enemies is out of the question now I'm deep in the spaghetti catacombs of Mars. All I can do is hold Space and hope that they're dead before I am. Wait, these aren't the spaghetti catacombs of Mars! This is just Chaos from Requiem all over again. Does this mean I'm going to have to dodge all those terrible wall worms again...? And what's that that's appeared on the radar behind me? It was a magnificent last stand, with exploding bats and bouncing score icons everywhere, but it's no use. Mega Star makes a screeching sound as he's de-rezzed. I just noticed he doesn't have any pain frames. He just glows a bit. He doesn't bounce off the enemies, either, so it takes me a while to work out what to do when they run into me. Do I try and run away backwards, or do I run through them to get through them faster? It's a moot point anyway, because Mega's really, REALLY slow. It's a massive spider boss. It's only level 2 and I haven't been given any different weapons yet, so how hard can it be? As soon as it sees me, it bleeps and dozens of tiny spiders start flying out of its backside. Then it runs at me. 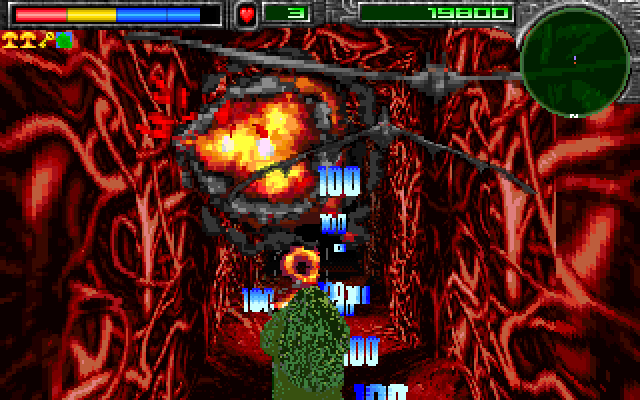 While I'm standing here frantically fiddling with Mattias' gears to get to safety, something triggers a trap that fills the corridor I'm in with a wall of flame and I'm killed again. 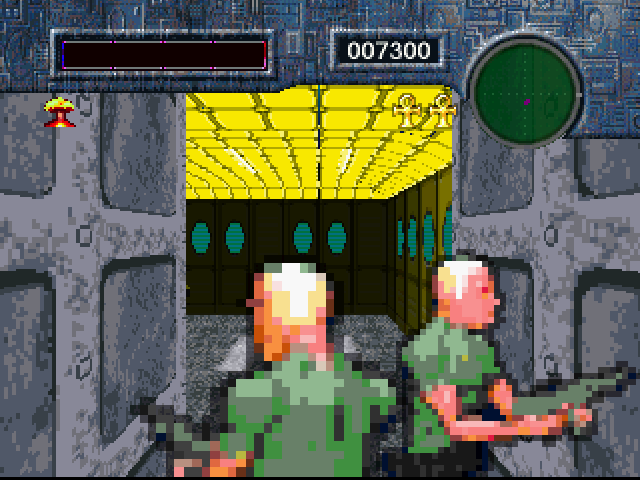 The corridor has a moving automatic fire wall that flushes every few seconds. 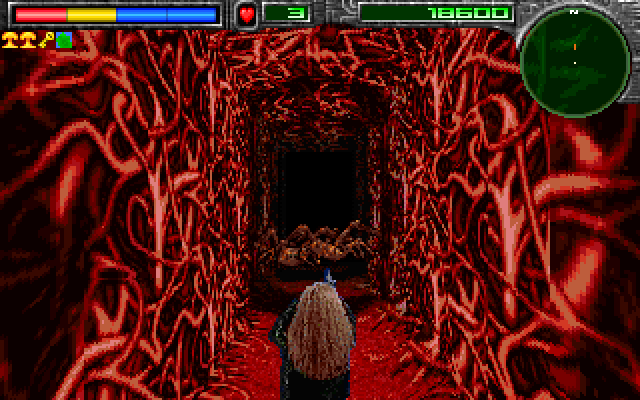 I couldn't lure the boss into the fire, but I could stand at the end of the corridor and shoot into the darkness. The radar can see twice as far as I can, so alternating between shooting into the darkness and moving a few inches is the order of the day. Three more spider bosses later and I'm on the next level. With robots! I like these ED-209-like robots, they're cute and make a big bang when you blow 'em up. These wide open spaces look like a great setting for some third person shooter action, but Mattias only wants to walk in compass directions and diagonals. If you crouch, swivel and then walk, Mattias will awkwardly automatically turn to face the nearest direction he likes before he starts walking. I suppose it makes the collision easier and stops you getting caught on walls. 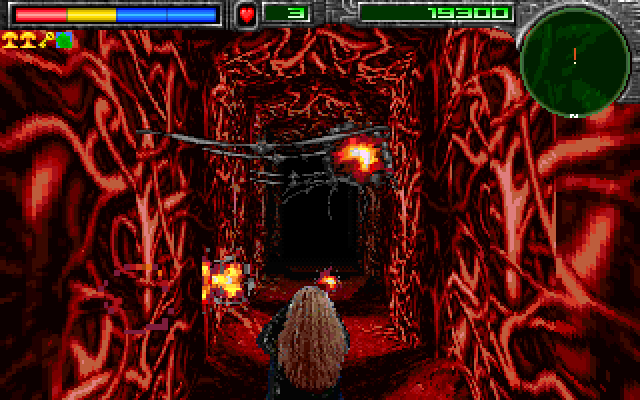 The strafe keys (comma, full stop) are nowhere near the walk keys (cursor keys), which is making it difficult to dodge enemy shots. 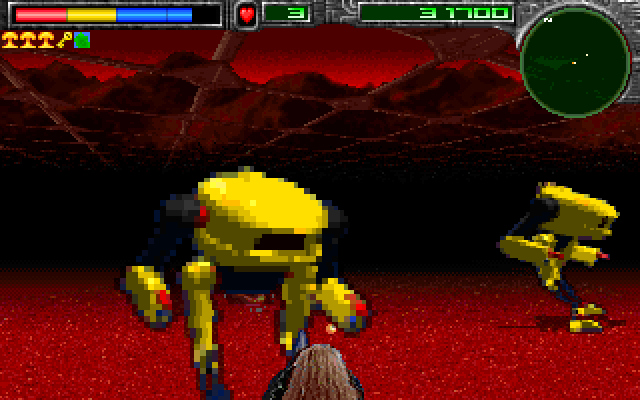 Thankfully, this robot is the only enemy I've found which shoots at me and its shots are incredibly slow. I've got plenty of time to hammer every key on the keyboard to find the strafe keys and calmly slide out of the way before the shots get anywhere near me. Anyway, enough of this. 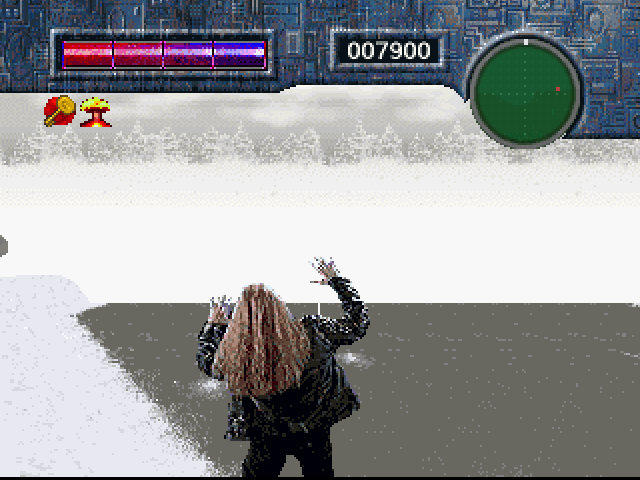 I'm completely stuck on this level and you want to see the main event: Virtuoso on the 3DO. Digitised characters, a whole disc's worth of zany FMV action just waiting to be poured onto your aching brains like an ice-cold soda pop into a parched throat! I can't wait! It's exactly the same. There's no FMV intro. I can't believe I'm saying this, but I miss those Crystal Dynamics games. 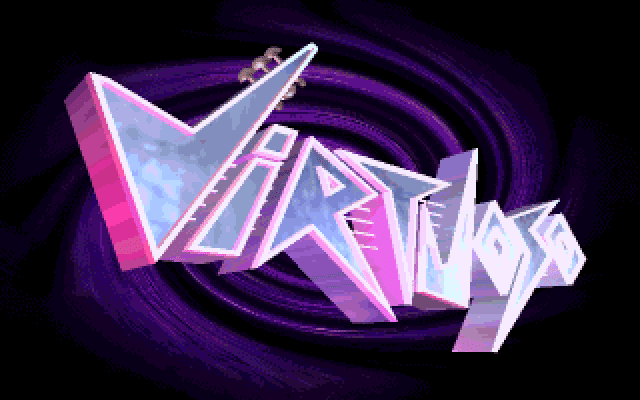 To be honest, Virtuoso looks a bit worse on the 3DO than it did in DOS. Mattias has gained a bit of height, but seems to be missing half his colours. 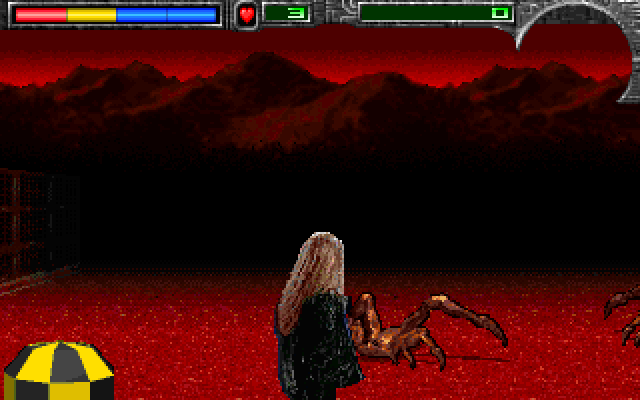 The floor is rendered using the 3DO's graphics hardware and it doesn't fade off into the distance. You can see here that it looks like I'm standing on a big red platform. They've got shading working for the robot baddies, so why doesn't it work on the floor? 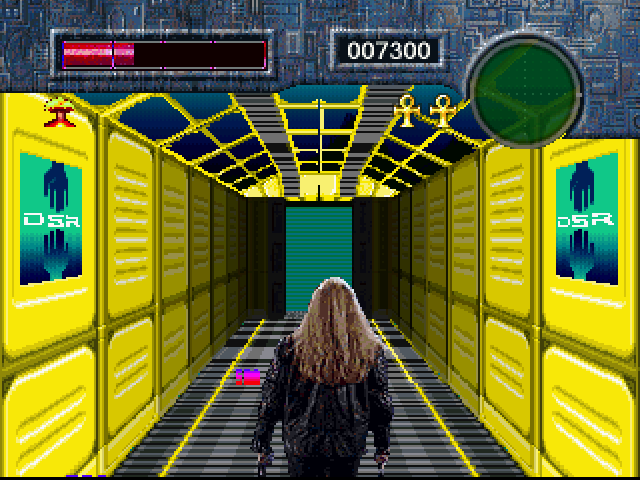 For music, the DOS version I have has some awful synth module stuff. The 3DO version, however, has proper CD audio! Yay! It's from a band called 'Thai Dyed Suicide'. They're good, but there's an amateurishness to it, as if they were a local band drafted in at the last minute. And of course, that suits the game fine. They sound like they'd have a Myspace if they were around ten years later than they were. So somebody made a Myspace for 'em. Sadly, there isn't a unique CD track for every level. 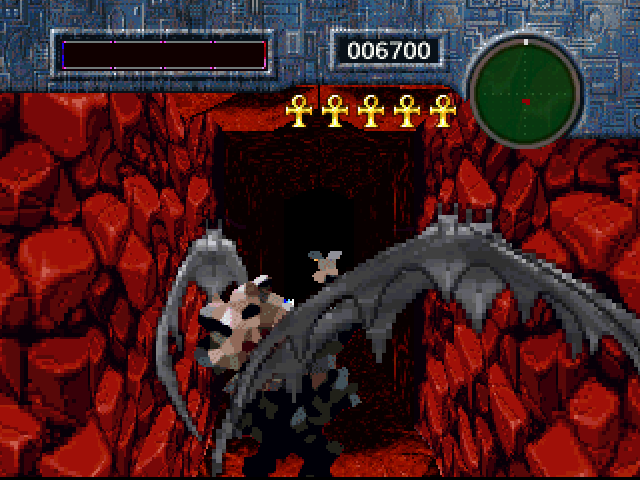 I'm spending a lot of time lost on each level, even with a map, and the looping music is driving me nuts. As for the controls, it's a tie. 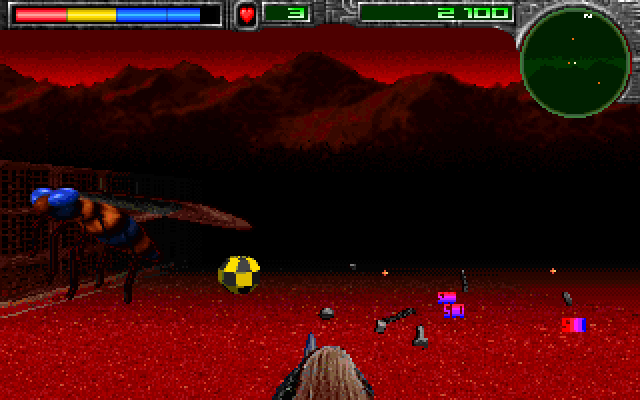 The 3DO lets you strafe with the shoulder buttons and turn 180 with the C button, but it's not a lot of help. 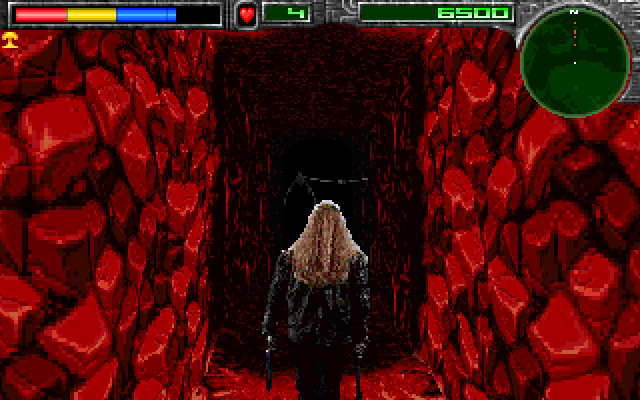 Mattias just takes so damn long switching between his actions, ignoring your pleas to turn around and shoot those bloody bats that like to spew out of the CORRIDOR YOU CAME FROM. But lets take a moment to admire Mattias' frames. He's not badly animated at all. He leans against walls when you move near them and shimmies along walls and around corners nicely. If you back him up against a wall, the camera turns around and you see him from the front. Why? Why not! These controls might be awkward but I suppose they're the best you're going to get out of a PC keyboard. There's no excuse for it on the 3DO, but if it's a straight port, then what can you do. Maybe it could be passed off as a deliberate gameplay choice. People seemed to give Resident Evil 4 a free ride, after all. This is the Haunted House level. You're probably as suprised as I am. 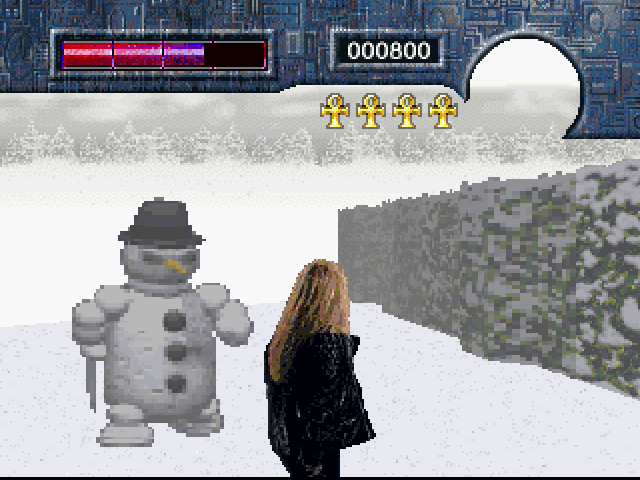 The shiv snowman wants to gut me, but he's even slower than I am. I wander around the snowfield for hours, again, finding little sign of the haunted house. There's nothing but shivmen and giant snowballs that run through you. I thought I was onto something when I found this concrete path. Mattias falls into the water and dies. The end. 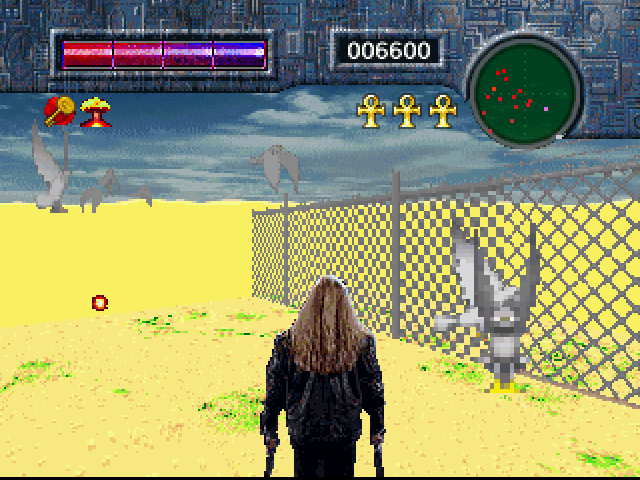 This is the Marine level. You can it's underwater by the blazing sunshine and all this sand. 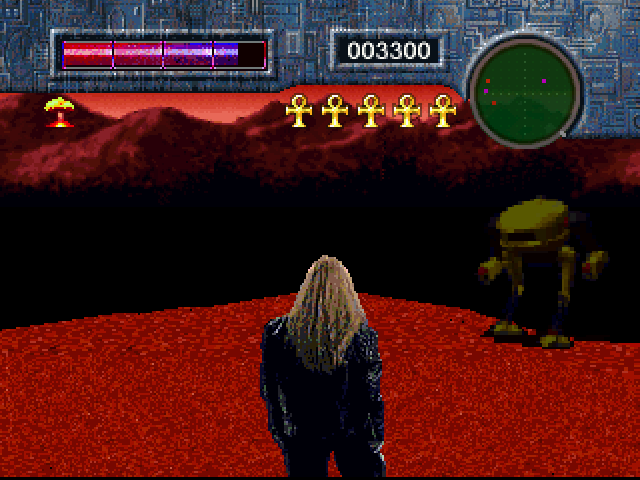 It's another wide open featureless level with a key and an exit hidden on it somewhere. I waste almost all my lives running around in circles while seagulls whoosh across across the screen and peck my brain in. Every second I spend here, more seagulls appear. You can see on the radar how many there are. I don't stand a chance at shooting them. There's turrets in all the corners of the level. Everything here is making its own awful noise, I'm stuck in an impenetrable mass of sound effects. I've finally found the underwater part of this underwater level. Mattias has decided to invade Sealab. I wonder why these guys aren't digitised characters too. Maybe they're androids. They sure move like robots. They slide around the mouth of the corridor and back again like shooting range targets. They're deadly, too. That's what I get for skipping ahead two episodes. Nobody should be disappointed with Virtuoso. If you buy something that looks like this (MobyGames link), you shouldn't be surprised that that's exactly what you get. Yet, who makes a 3DO game with digitised characters and no FMV? It's a very difficult third person shooter with controls that are unresponsive at the best of times and absolutely impossible to drive without a lot of practice. Still fun though, I suppose. I'm not really that struck on it, because I doubt there's going to be any resolution to the story. You're playing as a guy who's bored. After you finish shooting everything, is he going to be any less bored? Why would I care whether he's bored or not? I bet we're not even going to get a picture of the guy giving a thumbs up when we're done! When the best thing about the game is 'some dude dressed like the main character once', you're probably not in for the game of the century. Coincidentally, this was also the best thing about the The Getaway series: Both TG 1 and 2 come with a silly live action poster of the main cast (external link).